BDS says that Israel is an apartheid state. This analogy mis-states the key problem, which is a conflict between two peoples….. There are a few problems with this. For a start, the concept of a “people”, like the similar “nation”, “ethnicity”, or even “race”, is nebulous, difficult to pin down, and regularly shifting according to discourse and circumstance. For example, the idea that there exists a distinct and separate “Austrian people” is a development that followed World War II. Prior to that, Austrians were widely seen, including by themselves, as merely a subgroup of the wider “German people”. It was the need, in the aftermath of Nazism, to forge a new identity and loyalty to the Austrian state that produced a sense of distinct Austrian-ness. But more significantly, Hirsh here is accepting an implicitly ethno-nationalist view of the Israel-Palestine conflict. The argument that essentially follows from this is that there are two peoples – Jews and Palestinians – in the territory that was once Mandatory Palestine, and that because they are different peoples, conflict inevitably arises, with the Jews all on one side, and the Palestinians all on the other, and so they have to be separated into two separate states in order for peace to reign. And indeed, “two states for two peoples” has been adopted by Israel as their specific vision for a peace settlement. This attitude by Owen and the other mediators in the war was later lambasted by scholars of the topic, such as Toal and Dahlman, Noel Malcolm, Brendan Simms, and others, but perhaps most notably by David Campbell, who made very clear right away his contention that the ethnically-based partition proposals for Bosnia endorsed by both nationalists and mediators were proposals for apartheid in Bosnia. Getting back to Israel-Palestine now, let’s make one small change to the aforementioned phrases. Suppose that Hirsh had referred to the conflict not as a “conflict between two peoples” but rather as a “conflict between two races”. Suppose that the Israeli official peace position was “two states for two races”. I find it hard to believe that they, or indeed most people, wouldn’t find such phrases somewhat disturbing. It raises memories of horrific practices of racial segregation. Yet I haven’t actually changed anything substantial, merely swapped out the more sanitised, anodyne term “people” for the more connotation-heavy “race”. A more appropriate way of viewing the conflict, and indeed many ethnic conflicts, is the one provided by Alain Gresh – that of “a conflict between opposing ideals”. In other words, the conflicts take place between different visions for what should happen to the area of land in question; how many states should there be within that land? What should the borders of those states be? What should the political structures of those states be like? In Bosnia-Herzegovina, the conflict of ideas was between a single, united, multiethnic and secular Bosnian republic, comprising all of Bosnia & Herzegovina, on one hand (the stance supported by the Bosnian government), and a three-way division of Bosnia along ethnic lines into three states or quasi-states, each explicitly marked as “Serb”, “Croat”, or “Muslim”/”Bosniak”, on the other (the stance of the Serb and Croat nationalists). There were, among the proponents of the latter, differences over along which border lines the separations of the three peoples should take place, but no fundamental disagreement that the peoples should be separated. So what are the ideas in conflict in Israel-Palestine? Gresh frames it as a conflict between the unitarist one-state solution and the partitionist two-state solution, both of which have, at different times and in different ways, been advocated by both the Israeli side (or the Zionist side prior to 1948) and the Palestinian side. But in my opinion, this doesn’t go far enough. I would argue that there have been, in general, two consistent competing proposals on the Israeli side, and three successive proposals on the Palestinian side. Firstly, we have the Israeli maximalists. Their idea is quite simple – there must be a Jewish state over all of the land between the river and the sea that was once Mandatory Palestine, and the Palestinians (possibly excepting a small enough number not to “threaten” the clear Jewish demographic majority) either expelled or deprived of citizenship. As the former of these options is no longer seen as acceptable, most modern maximalists prefer a form of the latter – the most popular version, endorsed by Naftali Bennett of The Jewish Home Party and Danny Danon of Likud (among others), proposes annexing Area C of the West Bank, which consists of virtually all the Israeli settlements plus all of the sparsely inhabited areas, and leaving the Palestinians with the disconnected patchwork of areas that constitute Areas A and B. Though not for a state, just for some sort of non-state “entity” both legally and factually under Israeli control, i.e. a bantustan. Opposing them within Israeli politics, we have the partitionists. The partitionists believe that it is not realistically possible in the long run to rule over the Palestinians without granting them citizenship – and once they do have citizenship, Israel will by necessity cease to exist as a Jewish state and become a binational state instead. As such, the Palestinians must be granted a separate state in a large chunk of the region. Politicians in the centre or centre-left of Israeli politics such as Ehud Barak, Tzipi Livni and Ehud Olmert have all invoked fear of this to push for a partitionist solution in recent years. The origins of this position go back to the 1937 Peel Proposals, which first proposed partitioning Mandatory Palestine into separate Jewish and Arab states. David Ben-Gurion and many on the centre-left of the Zionist movement supported the proposal (at least for the moment), while those on the right like Ze’ev Jabotinsky opposed any partition. Modern partitionism has essentially meant support for the two-state solution with the Palestinian state in the West Bank and Gaza, though many partitionists hope that East Jerusalem and some other small territorial chunks on the border can be annexed to Israel as part of the deal. In addition, given the current state of the “peace process”, it’s not too difficult for an Israeli leader to present themselves as a partitionist while seeking to avoid an actual settlement and thus de facto perpetuating a maximalist vision – Netanyahu is the the perfect recent example. The first position of the Palestinian side was the nativist argument. The tenets of this were that i) there should be a single, independent Palestinian state, and ii) the recently arrived Jewish immigrant communities should not be entitled to the same rights as the native population. There were varying views on how far this should go. Some held that the new arrivals should be expected to culturally assimilate into the native majority over time. The Arab Higher Committee held that the Jews could stay, but only those who had been in Palestine before the start of the British Mandate should be entitled to citizenship. The Arab League’s position in the summer of 1947 was that Jews born in Palestine could stay and be citizens, but that those born elsewhere should be expelled. But unifying all of them was a view somewhat similar to modern right-wing anti-immigrant parties – that the Palestinians should entitled to decide their immigration policy and that the new Jewish arrivals, as immigrants, would have to go along with it. This was not a view that “Jewish” and “Palestinian” were mutually exclusive, however – the “Old Yishuv”, the mostly Arabophone native Jewish community who predated Zionism, were generally accepted as legitimately Palestinian. In the late 1960s, the nativist position went out of fashion. The driving change for this was Yasser Arafat and Fatah joining the PLO after the Six Day War. They subsequently pushed the Palestinian nationalist movement to adopt the republican position. Under this proposal, all of former Mandatory Palestine should become one state, as with the nativist stance, but unlike the nativists, the republicans held that all permanent inhabitants of this states, regardless of religion, and regardless of how they came to be there, should be equal citizens. As Gresh notes, this was in part motivated by a desire not to repeat the huge exodus of French pied-noirs from Algeria after they were not granted citizenship there. Binationalism is a form of republicanism here. Gradually, however, the Palestinians shifted in the 1980s to a partitionist position of their own, in which they would accept the idea of two separate states, with a Palestinian state being created in the West Bank. Despite agitation from minor groups like the PFLP who remain staunchly republican, partitionism has now become the mainstream opinion among Palestinian political leaders. However, the Israeli and Palestinian partitionisms are not the same position. To put it one way, the Israelis are pushing it for its own sake, while the Palestinians are pushing it purely as a reaction to the Israelis pushing it. From the Israeli partitionists’ perspective, the purpose of partition is to create two separate ethnically-defined states, one Jewish and one Palestinian. From the Palestinian partitionists’ perspective, the motivation behind partition is simply that no other position (like republicanism) has a chance of making any headway with Israelis in negotiations, and that the two states will simply be two states, with no ethnic ascription. This is why the whole question of Palestine “recognising Israel’s right to exist as a Jewish state”, i.e. Israel’s supposed “right” to have a Jewish demographic majority. We can say the conflict is just about how exactly land should be divided all we want. And to a large degree, it is. But that ignores the question of precisely who we’re dividing the land between. Only the Israelis say the division is between “two peoples”, the Palestinians just see two states. 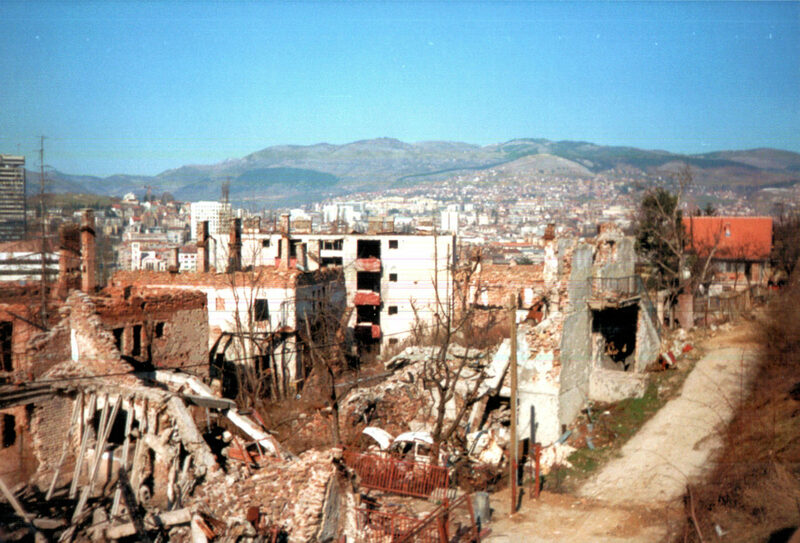 Sarajevo during the 1992-95 siege.